Music has a way of weaving through our being and permeating our souls. We associate times, happy and sad, joyous and devastating with songs and music and words. This book introduces classical music pieces with everyday occurrences. The words lead the way through life scenarios and the musical suggestions at the back of the book for each situation gives readers the hook – the hook to ‘music’ their whole life – to a cognitive and accessible symphony that they can always refer to. It also provides the knowledge that this is possible. 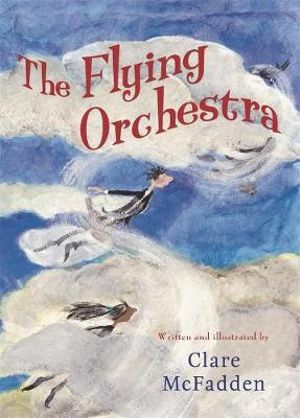 The illustrations (which won the CBCA Crichton Award for Illustration in 2011) are exquisite and dreamily float the reader along through the story. At the back of the book is a list of all the musical pieces to listen to for the page scenarios. This book is a meditation in love and life on many levels. It’s meaning will be individual to each reader and each reading will add depth. I want to lie under a tree and study each page whilst listening to the suggested music. I want to imagine ‘The Flying Orchestra’ in the trees around me – and I’m sure you will too! …and the next time a baby is born I will play ‘Aria ‘Schafe konnen sicher weiden’ (‘Sheep May Safely Graze’) from Cantata (BWV 208) by Johann Sebastian Bach. …and the next time my husband misses the train, I will tell him to listen to 5th Movement ‘Chaconne’ from Partita in D minor for solo violin (BWV 1004) by Johann Sebastian Bach, instead of getting stressed. …and all the other musical teamed scenarios will now have a song of reference! Enjoy the soundtrack of life through this delightfully unusual book.